Here’s the deal…We just did a Full Front Row install on a 1999 Ford F150 Lariat. The color of these seats is Prairie Tan. 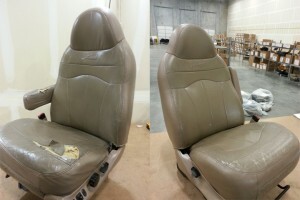 As you can see in the before pictures below, the driver bottom and armrest needed some foam repair. We added some 1/2″ foam to the entire bottom foam cushion, as well as a new foam block to the center of the armrest. 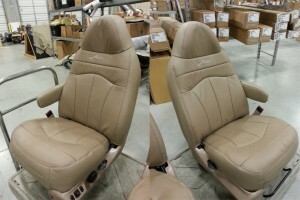 If you have any questions about factory match replacement leather seat covers, give us a call at 214-710-2565, or visit our website at www.theseatshop.com. Check out the before and after pictures!